Drafting a new Horizon 2020 proposal takes many iterations. A simple, but advanced tool to help you get started is a Proposal Canvas. 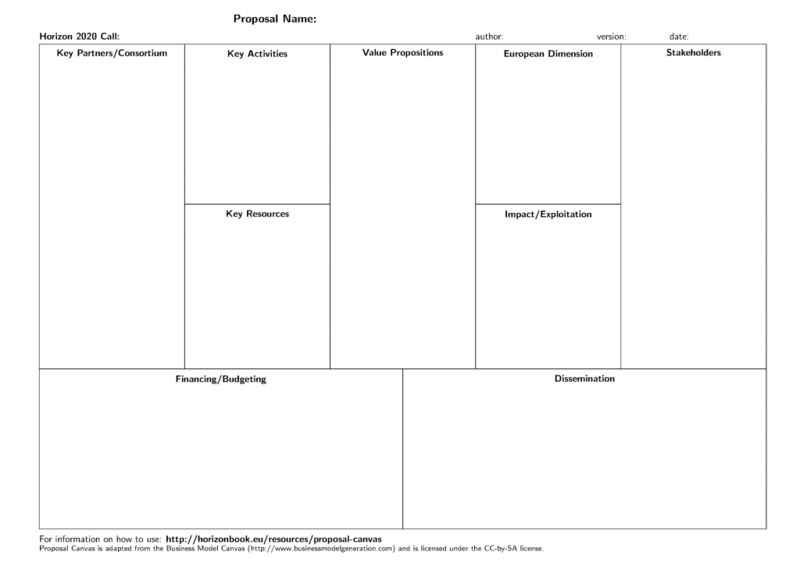 The Proposal Canvas is a tool adopted from the Business Model Canvas by Alexander Osterwalder. Since the release of Osterwalder’s work in 2008, new canvases for specific niches have appeared. Here is an adoption for Horizon 2020 and other EU proposals. I have prepared a pdf template: proposal-canvas.pdf. Please share the Proposal Canvas if you find it useful. The Proposal Canvas is a strategic planning tool and template for developing new and documenting existing Horizon 2020 proposals. Basically it is a visual chart with elements describing a consortium’s proposal, including stakeholders, European dimension, financing, impact and dissemination. It assists organizations and consortia in positioning themselves and assuring the proposal is aligned with the EU call. In such a canvas conflicting goals and trade-offs can be easily visualized. The Proposal Canvas can be printed out on a large paper so groups of people can start drawing and discussing proposal elements together. It is easily used with post-it note notes or marker pens. The Proposal Canvas is an example tool to enable rapid prototyping of different proposal options for a call. It is a hands-on tool that fosters understanding, discussion, creativity, and analysis. Draw a canvas in one sitting. While writing a complete proposal can take weeks or months, an initial proposal idea should be drafted quickly. It is okay to leave parts of the canvas empty. Rather than over-researching or debating the “right” answers, put something down quickly or leave it blank and come back to it later. Some things take time to figure out. The canvas is an evolving document. Focus on the specific Horizon 2020 call. Filling in the canvas helps you align your proposal with key Horizon 2020 aspects like European dimension and impact. Use a stakeholder-centric approach. Be clear about who is going to benefit from your proposal. 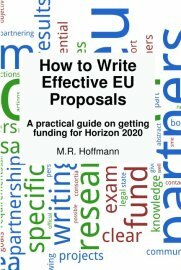 More information on how to network, find partners and write a proposal is in the book “How to write effective EU proposals”. I’d like to improve the Proposal Canvas. If you have any addition or comment, please let me know through the form below. The Proposal Canvas is adapted from the Business Model Canvas (http://www.businessmodelgeneration.com) and is licensed under the CC-by-SA license. It’s a user-friendly tool, also for beginners. Thanks! Thank you, a good tool.